Small Brushed Brass Briefcase Hasp. 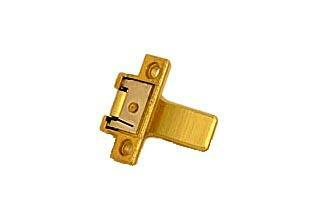 This is our most popular small solid brushed brass briefcase hasp. It is an appropriate replacement catch for many briefcase combination/ key locks however, do check dimensions and detail closely, as slight differences in design may mean certain spares won't work with your briefcase. Dimensions 41mm (closed length) 31mm wide. Hole centres 28mm.